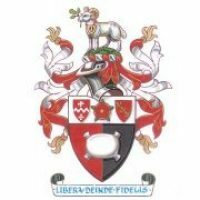 The former Borough of Godalming was granted its armorial bearings by the College of Heraldry in 1893. Following the re-organisation of local government in 1974 the Town Council adopted the coat of arms under authority of an Order in Council dated the 16 April 1975 and exemplified by the Kings of Arms on the 10 December 1975. The woolpack represents the traditional local clothing industry and is taken from the 18th century town seal. The growth and prosperity of the town was closely bound up in the wool trade. The red rose (centrally above the woolpack) reminds us of the charter that was granted during the reign of a Tudor sovereign ie. Queen Elizabeth I on the 25 January 1575. The two shields (one either side of the rose) commemorate John Perrior, the first town warden in 1574, and Salisbury Cathedral, which held the manor from 1117-1541 when it was conveyed to the crown and then sold in 1601 to Sir George More of Loseley. The one on the right shows three pears, which is a punning rebus on the name Perrior. John Perrior himself was a substantial clothier – manufacturer of cloth – but his earlier family could have had ties with the production of perry, made from pears. Stanley Dedman argues that the one on the left is supposed to be the shield of Salisbury but this is wrong and is actually the shield of a person named Jocelyn de Bailleul who was also a cleric living at the same time. Apparently their shields are very similar and it is the shield of Jocelyn de Bohun, Bishop of Salisbury, that should have been included but the College of Arms made a mistake. The ram (on top of the slashed cloak) emphasises the town’s early association with the wool industry and is taken from the crest of the Clothworker’s Company. The ram holds a pear in its mouth, another reminder of Perrior. Also round its neck is a pair of shears, which indicates that in this instance it is the wool of the sheep that is of particular significance.